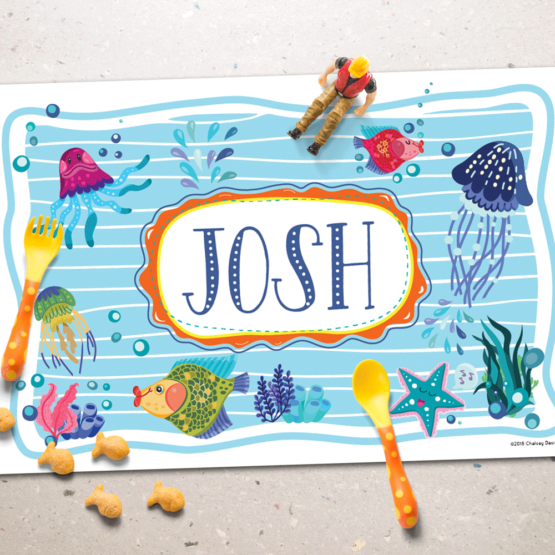 These super cute personalized placemats are fun AND educational! With a fun character to suit a child on the front with their name, and on the other side you will find their Name, Alphabet, and Numbers for printing practice! These super cute personalized placemats are fun AND educational! With a fun character to suit a child on the front with their name, and on the other side you will find their Name, Alphabet, and Numbers for printing practice. Practice printing your first AND last name on this super durable 10mm laminated alphabet placemat! Features both uppercase and lowercase alphabet printing practice with coordinating beginning sound food examples. Kids love seeing their name and practicing in cursive! Printed in high resolution bright colour schemes and coated with a durable 10mm laminate will allow hours of practicing and wiping. Please enter the first AND last name in the Personalize tab below to have this product made uniquely for you! This personalized Munch-mat placemat is custom designed for you using your name choice and covered with an almost bullet-proof 10mm laminate. They are sure to withstand a lot of spills, wipes, and finger-tracing fun! Kids can start practicing the spelling of their first AND last name, and get busy and creative with their addition and subtraction skills! Printed in high resolution bright colours with a super duty 10mm laminate that will allow for lots of wiping and starting again. Please enter the first AND last name in the Personalize tab below to complete your order. This Munch Mat is custom designed for you using your name choice and covered with an almost bullet-proof 10mm laminate. Little ones can practice writing their first AND last name and lowercase alphabet, along with number practice 1-10! To personalize, please enter the FIRST and LAST name in the Personalization tab below! Do you have a kid obsessed with the ocean and all it's fun and colorful wonders? Then this is the placemat for you!